The holidays are coming to an end and it’s time to get back into a regular food prep routine. I did a short food prep last week and it reminded me how much better I eat when I have healthy food prepared. I eat more regular meals, I eat way more vegetables and I save a ton of money by not constantly making trips to the grocery store. Today I’m bringing back my weekly meal prep posts where I share what I’m making for the week ahead. I like the flexibility to change what I eat day to day, so I don’t prepare packed meals for the week but rather ingredients that can be combined in salads and bowls plus 2 to 3 entree dishes, some sauces and a couple of snack recipes. Roasted Carrot Salad. I’ve been thinking about a roasted carrot salad with lettuce, kale, pecans and a sweet yogurt dressing. I’ll make the roasted carrots as part of food prep and then try this salad during the week. Burrito Bowls. One of my favourite quick meals. I can use the rice and beans I made for food prep then add salsa, avocado, corn, cilantro, onion, lettuce and peppers. Pesto Roasted Cauliflower. I’ve had this pesto roasted cauliflower idea in my head for a while and plan to give it a try this week. I’m not sure if I’m going to put the pesto on for roasting or just add it after. Either way, it’s going to be good! Purple Yam Breakfast Bowls. I love squash, yams and sweet potato bowls for breakfast and this week I’m going to have purple yam breakfast bowls. I’ll bake these as part of food prep then stuff them with peanut butter, granola and yogurt during the week. Spaghetti Squash with Brocolli, Mushroom and Peanut Sauce. I’ve been thinking about big, noodle-y stir-fry with sautéed broccoli and mushrooms and topped off with a creamy peanut sauce. I don’t want to use rice noodles because I love huge portions, so I’m thinking spaghetti squash is the way to go here. I can’t wait to try this! My pantry is already full of the rest of the ingredients I need. You can read all about how to stock a vegan pantry here. Weekly meal prep is one of the ways I test recipes so a lot of the things I share in these posts are recipes in the works. I usually have to make a recipe 2-4 times before I’m ready to share it on the blog, so food prep this is a great way to test recipes and make sure nothing gets wasted. Whatever I’m testing is still edible, so we eat it for food prep and then I can adjust as needed to for the next round. Anyways, if there is something here you’re interested in a recipe for, let me know in the comments but chances are it’s coming soon. 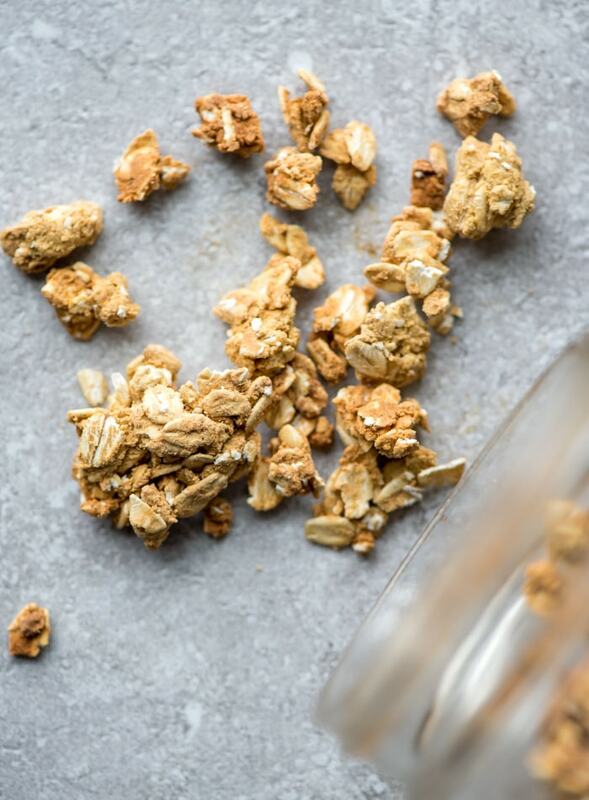 This is a recipe I’m testing for a low-fat, oil-free, peanut butter granola made with protein powder. I really liked how this batch came out but I want to try to use less maple syrup. I ended up using 1/2 a cup for the whole recipe, which isn’t too bad but I’d like to reduce that. I’m thinking of reducing it to 1/4 or 1/2 cup and blending it with either soft tofu or applesauce to replace the liquid. I loved how crunchy this came out so chances are you’re going to see a recipe soon! In the meantime, you can check out my Peanut Butter Granola, Mocha Granola, Sugar-Free Cinnamon Raisin Granola or Pumpkin Spice Latte Granola. Whole roasted carrots have been one of my favourite things to eat lately. They’re so good they’re almost like candy. You can make them with or without oil and any spices you like. I usually make them without oil but a bit of olive oil does give a better result in my opinion. As for seasoning, I typically just use some sea salt and black pepper but cumin, curry powder, ginger and even cinnamon is really good. I eat these for snacks, add them to salads and just eat as a side to my main meal. To make them, simply place whole carrots on a baking sheet with a tiny drizzle of olive oil and roast at 400 for up to 50 minutes until slightly crisped but very tender. Try them on my Roasted Carrot, Kale and Quinoa Bowl or Roasted Beet and Carrot Salad. This was another recipe I started putting together this week. These bars are nut-free and they did come out pretty tasty but are not ready for sharing yet. I made them with dates, protein powder, tahini, sunflower seed, hemp seeds and cacao powder. They’ll be good for treats this week but the recipe needs adjusting. For some other options for snack bars, try my Nut-Free Chewy Vegan Granola Bars, Coconut Pumpkin Spice Latte Energy Bars or Coconut Banana Energy Bars. I prepped a batch of pesto to eat over zucchini noodles, salads, chickpeas and pasta. I used cashews, nutritional yeast, basil, garlic, lemon, spinach and some water to adjust the consistency. I also want to try roasting some cauliflower in this. If you’re looking for a vegan pesto recipe, try my Low Fat Pesto Spaghetti Squash, Low Fat Vegan Pesto Zoodles with Broccoli, Spinach Hazelnut Pesto or Vegan Kale Walnut Pesto. I baked a couple sweet potatoes and purple yams to eat for breakfast as Sweet Potato Breakfast Bowls and to add to salads. Sweet potatoes are my favourite source of healthy, complex carbs and I eat some variety of yam or sweet potato most days. I baked one spaghetti squash to make Peanut Spaghetti Squash with Mushroom and Broccoli and one acorn squash to eat as squash breakfast bowls. For more spaghetti squash recipes, you can check out my Low-Fat Pesto Spaghetti Squash or Spaghetti Squash Marinara. I’ve been thinking about cashew carrot soup for so long I just had to make it this week. It made it with carrot, cashews, ginger, coconut milk and spices. You can find the recipe here. For other easy carrot soup recipes, check out my Curried Ginger Carrot Soup, Coconut Ginger Carrot Soup or Thai-Style Roasted Butternut Squash and Carrot Soup. This is another recipe I’m testing for classic Rice and Beans. I used brown rice, kidney beans and spices and it came out really good! This is an awesome, inexpensive and simple recipe you can eat for breakfast, lunch or dinner as a side or a main. I prepped this one a week ago so it was ready to start eating today. Sauerkraut is so easy to make at home and so good for naturally supporting a healthy gut. I make a batch about once a month to every 6 weeks. This one had red cabbage, green cabbage, carrot and garlic. I like to eat a couple tablespoons per day in salads. I’ll be sharing exactly how to make it in an upcoming post but basically you just add shredded cabbage to a bowl with a bit of salt and let it sit for 20 minutes or so. Then you squeeze it to extract all the liquid, pack it all into a jar, cover with paper towel or a coffee filter and place somewhere dark and dry for at least a week. Once it’s ready to eat you can seal the container and store in the fridge for up to 3 months.